The commercial starts with a man sleeping leaning on a table and a mosquito was flying over him. The mosquito keeps on flying and moves towards his ear and suddenly it was squashed by the man’s ear. The commercial ends with a quote saying that there will be invisible man inside the room to kill the mosquito if we have Tortoise Mosquito Coil so that people can sleep safely. 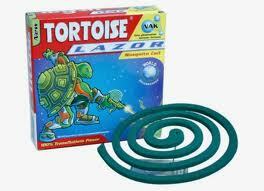 This commercial makes people to feel safe from mosquito if they have tortoise mosquito coil. Now a lot of people buy mosquito coils to keep them free from mosquito. These type mosquito coils generally burns for 8 hours during which smoke which contains aldehydes, ketones and particulate matter. These smoke causes health concerns like lung disease. It not only affects human but also causes air pollution. The particulate matter emitted from one coil is similar to smoke from 70-120 cigarettes and formaldehyde from a coil is same as that of burning 51 cigarettes.